One of the great things about social media, is the opportunity to meet people and make new friends with people of similar hobby interests. I know there is plenty wrong with social media, but this story isn’t about that. Long story short, after chatting with someone on a Instagram post of mine, we agreed to meet and hike to English Falls. Shortly after, this person invited me for a day hike at a place called The Wilds. The Wilds…for years has been nothing but a sign along US 64 and US 178 in the Brevard NC area to me, seen as I pass it by on my way to other Waterfalls. I had often wondered what exactly it was, but had never seen any one else on social media mention it. Since it was never mentioned in the world of Waterfalls online, I just dismissed it. I guess I just thought it was some camping place or hunting place, without any waterfalls to see. This did change when Kevin Adams, author of “North Carolina Waterfalls” posted on his website….www.kadamsphoto.com. He had some amazing photos of a couple of the Waterfalls at the Wilds. The photos of Fourth Falls, or Great Falls with the snow covered setting was incredible. Please check out his photos on the link above. It was mentioned though that these were on private property and access was very limited and difficult to obtain. So, with all the Waterfalls that are available to visit and photograph, I simply wrote “The Wilds” off and enjoyed his photos like I so often do. Well, fast forward the the spring of 2018. I had just met a fellow waterfall chaser known to many for her blog at www.exploringwaterfalls.wordpress.com. In a relatively short amount of time, compared to myself anyway, she has complied a very impressive list of visited Waterfalls from Georgia all the way into the NE United States. She is very passionate about finding new Waterfalls, taking amazing photos, and sharing her work with others. I can relate very closely with this. Apparently, she was one of the lucky ones and able to obtain permission for a 1day hike at the Wilds before the summer camps for the children began. I felt very fortunate to have been invited to tag along and see these. It was an amazing opportunity that one just does not pass up. Now that every thing was set up and arranged, the bad news. We had an incredibly wet spring, May was unbelievably wet. This hike was on a Wednesday in May, just after 7 inches of rain on Tuesday night. This will be evident when the pictures start showing up. It was also pouring the whole way there and through most of the 1st half of the hike. The sign entering the place, set the stage. This was going to be a nice place. Driving into the camp and to the place of meeting, I was wowed. This was probably the finest camp for children that I have ever seen. The facilities and attractions were amazing. I had to stay focused, so I met my party at the parking area, next to the amazingly high flowing Toxaway Creek. I could tell by this photo, that Toxaway Creek was way above normal. These are cool water guns that are almost totally under water. I was worried about parking my car next to this creek in the parking area, afraid that I might see my vehicle falling over the waterfall while on the trail. Ok that is a bit of an exaggeration, but I was worried a little. Before the hiking was to begin, we had to check in at the office and sign the release forms, just typical forms agreeing to stay within the marked areas, and not holding “The Wilds” accountable if any accidents were to happen. Then we were off, ready to hike the hike on this beautiful, extremely wet day. Raincoats, umbrellas were a necessity on this day. After crossing Toxaway Creek and walking up some steps, we were simply following signs to Third and Fourth Falls. We came to a creek crossing on the trail which had a name of “Cool Spring” on it. I can only imagine that normally this is a tiny trickle of water that is easily stepped over. On this day however, is was a rushing stream that became a photo stop op, and then was somewhat of a challenge to cross. We all made it fine though. The Trail continued down. We continued to follow the signs past the First, Second, and Third Falls, until a sign going straight was leaving the Wilds, and Fourth Falls was a left turn. The weather was really bad, and I don’t believe we were quite certain how much of this we were going to see on this day. For this reason, we made the main attraction, Fourth Falls, goal number 1. The trail also got surprisingly interesting here, after the turn. It got quite steep, with ropes in place for assistance. I guess I was not expecting this in a camp like this, but it totally fits right in with the other big names Waterfalls nearby in the Jocassee Gorge terrain. There was a spot where the same creek we had crossed had to be crossed again with a rope going across as it was very steep above and below, and water by this point was really moving. This was the most sketchy part of the hike. There were plenty of these along the wet trail as well. Not wanting to hurt any of them, we had watch carefully where we stepped. As I mentioned, the hike down to the Fourth Falls was steeper than I had pictured it, and conditions were…..extreme to say the least. We finally reached Fourth Falls and it was a jaw dropping site. This is Fourth Falls, or Great Falls. Do yourself a favor and click on Kevin Adams photos in the earlier section of the blog. Compare this gorgeous waterfall with the amazing show of power we had today….Even though the rain had eased off by now, there was no need to pull out the DSLR cameras, as the spray from this waterfall was soaking us. Here are the “Exploring Waterfalls”crew long with “Waterfalls Hiker” enjoying Fourth Falls the best we could. “Exploring Waterfalls” and myself both had our $12.99 umbrellas from Costco, but they served little purpose down here. We got as close to it as we safely could. It was not exactly picturesque, but it was an amazing site that few will see. Even the wildlife was having trouble staying dry. Here is a couple of videos of Fourth Falls on this day. One is focused on a rock that normally is totally dry and people get out on it. On this day, this was impossible. This one was just a cell phone, I was walking to get as close as I could. We finally had to leave Fourth Falls and head to Third Falls. This one was also very cool and high flowing. Luckily, the viewing platform was way above the waterfall, and it was amazing today. The camp also has a zip line set up here to go across the canyon, way cool. On this day, Third Falls was much more photogenic. I am not saying that Fourth Falls wasn’t amazing, but at least here, we could pull our nicer cameras out and take some photos without being completely blown away by the incredible Fourth Falls spray! The rain had also let up just enough for the photos as well. We were very pleased by this. I’m not sure which one this was. I am guessing 2nd Falls, 1st Falls, maybe both. We caught this view from way above but got no closer to it. On the way back, I made a quick stop at Eastatoe Falls, but the very high flow took away the defining characteristics that makes it such a beautiful waterfall. Awesome post Chris. I also saw Eastatoe around this time. Wow, it was raging. Thank you for your kind comments, Chris. I feel the same as you, grateful for fellow hikers, like you, who are so kind and willing to share their knowledge with beginning hikers, like me. Because of you, I got to see English Falls, and learn how to take better photos on my “real” camera. I can’t wait to revisit The WILDS. Hopefully we’ll have much better conditions! You’re welcome Karen. Your photos btw have been wonderful. I would love to go see the Wilds again in different conditions. 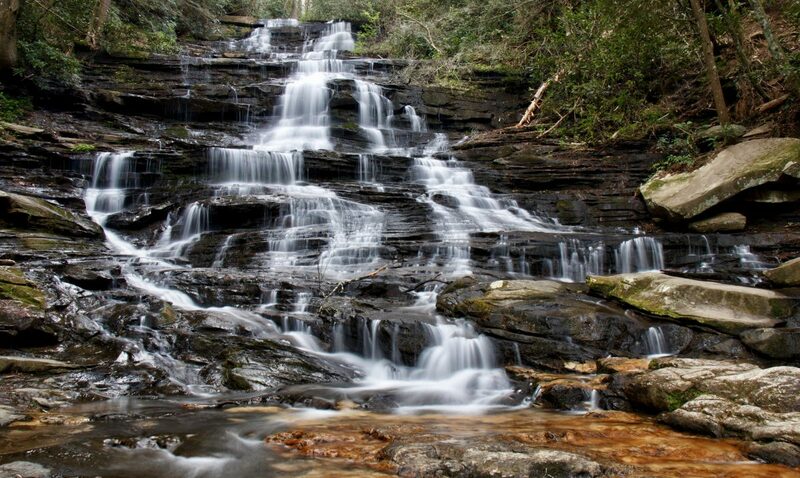 As time goes on, I have some waterfalls in South Carolina I would like to see as well. Great write up. Love the pics.